We're tight, you know? *likethis*. In fact, Tom Hanks calls me friend. Well, me and 58,000 other buddies of his. Still waiting on Pierce Brosnan, though. We're just *pending* friends at the moment. Of course, I expect that to change any day now. Book BIN Tuesday -- Samhain Print! Yes, today's the day Samhain print titles are released for the month. I know there are several new releases coming out, and for those of you who prefer print to e-books, you're in for a treat. One I'm really excited for is Meagan's Chance by L.C. Monroe. (aka Lucy Monroe) I've got the e-book edition but, knowing me, I'll be tracking down a print copy of it as well. HOW did I not know this book was being re-released? If you've read this blog for any length of time, you know I make no bones about being a Suz Brockmann fangirl. I want to be her when I grow up. :) I just love her books -- the characters, the dialogue, the stories, everything. I especially love finding books that are new to me, even though they were originally released years ago. A bad boy in black leather who’d never forgotten the first girl he loved...Clint McCade roared into town to visit his best friend, just as he had a dozen times before -- but this time the rugged photographer had romance on his mind! When Sandy Kirk told him she’d lost her heart at least, he knew he’d waited too long to claim her -- but vowed to help her get her man. Practicing seduction and pretending to be lovers started out as a game, but would their lips and bodies betray the desire neither dared to confess? In a book that’s steamy and sensual, witty and poignant, Suzanne Brockmann celebrates an unforgettable reunion between childhood buddies whose romantic destiny is definitely each other! He’d always ridden off into the sunset before, unaware that his heart’s desire was so close to home, but now that he’d figured out his dream, would she want the same? So to recap -- friends-to-lovers, bad boy in black leather, Suz Brockmann...what's not to love? All I know is that as soon as humanly possible I'll be heading to the bookstore to Buy It Now. Diva Contest -- Round Two! Just in case you've been following the Romance Studio's Diva Contest -- Round One is complete, and they're now on to Round Two. Check out some great websites! Where have you traveled in the world? Where would you most like to visit? At Fantasy Ranch, love is a game. Gavin owns Fantasy Ranch, a resort where guests get a week of cowboy love with the hottest cowboys in Wyoming. Rebecca's husband had promised to deliver her fantasy du jour: A cowboy. He died before he could keep that promise. She thinks if she plays the Fantasy Ranch game, just for a second she might have her husband back. And maybe that will be long enough to say goodbye. 2) No contact or attempted contact after the week is up. Clause number two is accompanied by a clear warning: Any attempt at contact will be considered 'criminal stalking' and treated as such. A sure sign the cowboys are very good at making women think they have fallen in love. So yesterday morning I wake up to find the DH has made cinnamon rolls for breakfast AND done the dishes. Nice way to start the day! After breakfast we headed to the family room where the kids gave me their school-made presents -- a bookmark, a sachet, a decorated mug -- and I opened a few cards. Then the DH handed me a card from the kids with a post-it inside. 1. Happy Mom's Day to you. Look in my closet in one of my shoes. 2. (In DH's dress shoe) You found me, way to be. Look by the TV. 3. (Under the back right corner of the downstairs television) Back upstairs you go. To the medicine cabinet. Don't be slow. 4. (Tucked in toothbrush packaging) Down you go pitter patter pitter pat. Look inside the Western hat. 5. (WWU baseball cap in front closet) Outside you go to the garage what a drag. Check out the lawn mower bag. 6. (Lawn mower bag, of course, in our detached garage.) What a long way you went. Back inside to child #3's tent. 7. (Play tent in child's room) You found this one, ain't life grand? Go check inside your lovely van. 8. (Under back seat) Go go go you are moving real slow. You will surely thank the kids a bunch. How about some Cap'n Crunch? 9. (Bottom of box in cabinet) Upstairs I do command. Do you think it's in a nightstand? 10. (Bottom drawer of DH's nightstand) To the basement shoo shoo shoo. I really want you to Love Me Do. 11. (Do you KNOW how many Beatles CDs we own? I do now. In the jewel box.) I hope you've had a nice trip. Look in the family room rip. 12. (Our family room couch has a rip in one of the cushions. It's there.) The treasure is close and not so faint, where do we keep the paint? 13. (Paint cabinet in basement) This is exhausting, you look really pale. Maybe you should send the mail. 14. (In mailbox on porch) They will say she ran and she ran. How about the X-mas tree stand? 15. (Back to the basement and the holiday decorations) The treasure you want so make your stand. I think it is in one of your baby's hands. 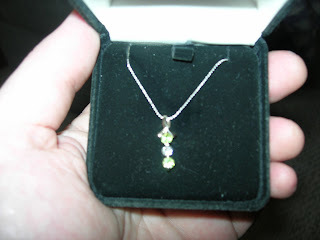 It's hard to see the colors, but it's a mother's birthstone pendant with my kids' birthstones -- peridot, diamond, peridot. Absolutely gorgeous, and completely unexpected. DH really outdid himself this year. Then we headed to the in-laws for lunch and an impromptu game of Wiffleball -- kids against grown-ups -- before collapsing for the night. It was all in all a perfect day. Hope your Mother's Day was everything you wanted it to be! Happy Mother's Day! May you spend it with the people you love. What Do You Do With The Teeth? This is something I never thought of before I became a parent. But seriously, what do you do with their baby teeth when they start falling out? I've got two kids shedding teeth at an alarming rate these days, and after the tooth fairy comes (and that's another story altogether), she's just not sure what to do with those no-longer-useful teeth. Throwing them away seems sad, in a way, but am I really supposed to KEEP them? I mean, ew. So if you're a parent, what do you do? If you aren't, but have an opinion, toss that my way, too. The back of my jewelry box is getting a little full. Whew! It's been a crazy month or so, with deadlines and day job pressures and family stuff -- did you know that with two kids in sports, we have exactly two free evenings in May? So I apologize for being so sporadic with my blogging, and I hope to do better from here on out. The edits are in on Hooked (which has a release date! June 30! Woot! ), and I'm in the downward slide for the school year, so life is good. That said, I'm two days late with my Book BIN recommendation for this week, but it's such a good read I had to plug it in here anyway. Simply Perfect, Mary Balogh's final book in the Simply series, is exactly what the title says. Just perfect. It's a beautiful, emotional, fabulous read. I thoroughly enjoyed it. Now, you know I'm a glommer, so once I discovered Mary Balogh I had to go back and read all of her books that I could find -- particularly the Bedwyn series and the Suddenly/Simply books as well. I do recommend that if you're new to Balogh, because a great many of the characters from these earlier books pop up in this one. It can be read as a stand-alone, but I think there are added depths when you know some of the backstory. Anyway, it's out in stores now, so I unreservedly recommend that you head to your nearest bookstore and Buy It Now!